The friar, Father Juan Abreu de Galindo, recalls in his "History of the Discovery and Conquest of the Seven Islands of Gran Canaria", that the pre-historic people of the Canary Islands, the Guanches, believed that the devil appeared at nights in the form of a "Shock Dog", a large, shaggy dog, also known as Tibicenas (in Canaria), Irnene (in La Palma) and Guacanchas. Tibicenas were demons with the bodies of great wild dogs with red eyes, covered in long black wool, and living in deep caves inside the mountains. Although we recognise these stories, the beliefs, gods and demons, to be part of the cultural heritage of the people of the Canaries, we also know it is possible for a large, shaggy dog to live well on the Canary Islands, and in particular La Palma. In the north-west corner of La Palma, a small number of dog-lovers breed the long-haired dogs called Pastor Garafiano. These dogs are in no way related to ancient stories of demons, but are rather a more recent product and look like a cross between a Collie and a German Shepherd. The Pastor Garafiano is sometimes called a Spanish Collie but, because of its build, it is unclear if the link to the collie is realistic. 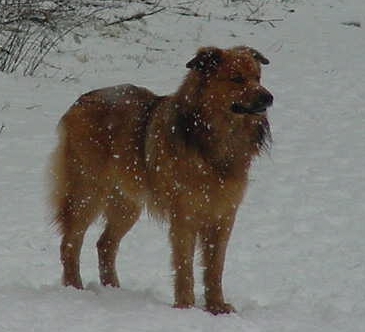 Some say that there are only a very few pure examples of this beautiful breed to be found today because of interbreeding with other breeds in the 20th century, for instance with the German Shepherd and Scots Collie. There is also a theory that all Garafianos with pointed ears are cross-breeds but, since most Garafianos today have pointed ears, rather than floppy ears, this view is not popular. There are also Garafianos with short hair, but the long-haired types are more numerous, and more appreciated. Breed Association: Asosiación Española del Perro Pastor Garafiano. C/ O'Dally, 31 38700 Santa Cruz de La Palma. The Pastor Garafiano breed is used mostly for the protection and herding of the local goats, Cabra Palmera. Must be capable of working for long durations and travelling great distances. They are adaptable, self-confident and intelligent, can move quickly and are capable of much activity. The breed is docile, calm, vigilant, easy to train and makes an excellent watchdog and family friend. He is good with children and with other dogs; an attentive and friendly dog. The breed is very well adapted to steep mountains. Extremely beautiful sheepdog, very intelligent, true and sensitive. Very good with children.